If you don't need the latest model, this is a top Cyber Monday deal on some amazing hardware. If you've been holding out until Cyber Monday to get an epic deal on a Microsoft Surface Book, now's the time to pounce. As long as you don't have your heart set on a swanky new Surface Book 2, right now you can get your hands on a mighty powerful Surface Book for $1,799.00 - that's $900 off the list price. This top-end Surface Book is crammed with features you'd expect to find in a full-size desktop PC. Powered by a 2.6GHz Intel Core i7 Skylake processor, it packs 16GB RAM and a 512GB SSD, with an Nvidia GeForce GPU running its 13.5 inch PixelSense detachable display. Its two-in-one design means that you can use it as a normal laptop, or you can detach the screen from the dock and use it as a multi-touch tablet. And if you have creative plans for it, the Surface Book comes complete with the Surface Pen, which will give you increased precision with its 1,024 levels of pressure sensitivity. With a third off its list price, this is a deal not to be missed. But if it's just a little too rich for your budget, there's still likely to be a Surface Book deal that's more to your liking. 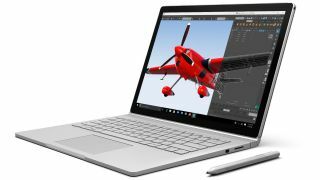 If you don't need heavyweight specs, you can instead grab a Surface Book with an Intel Core i5, 8GB RAM and 128GB SSD for just $949.00 - that's $550.00 off the list price, or if you prefer, a whopping 37% off. Don't hang about, though - we can't guarantee how long these Cyber Monday prices will last. And if you want a bit more choice, check out our roundup of the best Cyber Monday Microsoft Surface deals to see what other bargains are to be had.